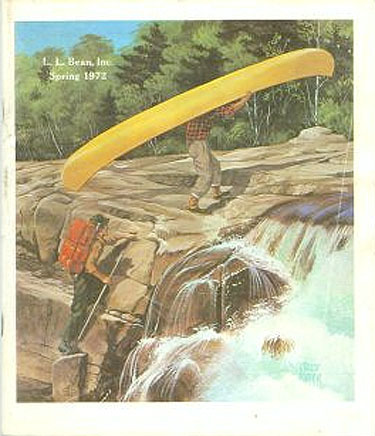 The L. L. Bean catalog was one of my favorite things to read as a kid growing up in sixties and seventies suburbia. The autumn issue was always the best. Before L. L. Bean became synonymous with blandly practical conservatism, the catalog was filled with specialized tools for specialized activities like fly-fishing, snow shoeing and canoeing. The images were sparse and the austere copy read with an implicit ‘down east’ dryness. Reading the catalog got me interested in cross-country skiing, strip planked canoes and sharpening knives. I would ask for field coats, chamois-lined khakis and camp moccasins for Christmas. I taught myself how to wax my own skis, split wood and catch trout on the many streams surrounding Philadephia’s Main Line. L.L Bean was proletarian, supplying hunters, trappers, fishermen and woodsmen with quality gear to support their livelihood. Bean’s products offered the luxury of the essential and represented to me a trusty touchstone amidst the angst and uncertainty of the Vietnam War. I learned that if clothing has a distinct purpose, it can transcend fashion. Emphasis shifts to the aesthetics of functionality. In many ways, my pursuit of self-sufficiency – craft – making things- begins with a fashion sensibility. The tool shapes us as much as we shape the tool. Posted by Scott on September 24th, 2008, at 9:08 am, and filed under all, Uncategorized.